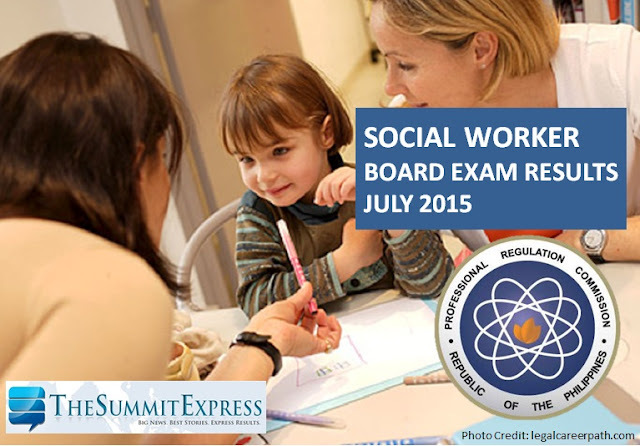 Those awaiting results of July 2015 Social Worker board exam can find here the list of passers, top 10 (topnotchers), top performing school and performance of schools as the Professional Regulation Commission (PRC) and the Board for Social Workers released results in 2 working days after the last day of exam. CONGRATULATIONS to the passers of July 2015 Social Worker licensure exam! PRC on Monday said that 1,817 out of 2,654 passed the Social Worker Licensure Examination. PRC administered the exam on Wednesday and Thursday, July 29-30, 2015 in the cities of Manila, Baguio, Cagayan de Oro, Cebu, Davao, Iloilo, Legaspi, Lucena, Tuguegarao and Zamboanga. July 2015 Social worker board exam was originally scheduled on June 28 and 29 but was moved responding to appeals from the academe to accommodate universities and colleges who have shifted to the new academic calendar and whose students graduated in the month of June this year. The board exam covered the following major subjects: human behavior and social environment and social welfare policies, programs and services (Day 1); and social work method and field practice (Day 2). In June 2014 board exam, PRC announced results in just 2 working days. PRC named a total of 1,110 out of 2,031 who have passed the Social Worker Licensure Examination. Bicol University-Daraga topped the schools with 95.59 passing rate. Like Us on Facebook or Follow Us on Twitter to receive more updates on social worker licensure exams.